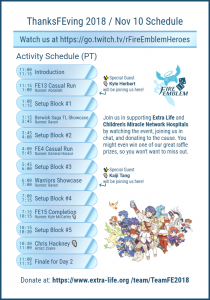 If you were able to tune in on November 3rd for Extra Life’s official Game Day event, you may recall the charity livestream featuring shenanigans from well known Fire Emblem players such as KirbymastaH and Gwimpage. With generous support, we were able to raise $1765 $1865! on our first day, which is absolutely amazing! 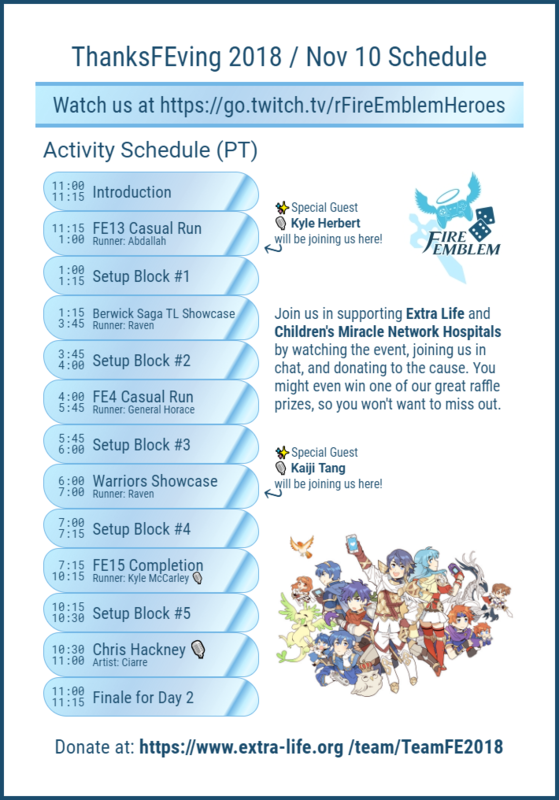 Day 2 is planned to start in about 15 minutes, can be viewed at our collaborative Twitch Channel, rFireEmblemHeroes, and will feature quite a lot of activity, including double the Voice Actor appearance and even more games. Additionally, our player roster leads off with the infamous Abdallah, starting things off with Fire Emblem Awakening, and will also feature our very own Raven, General Horace, and even Kyle McCarley himself. If you’d like to be eligible to win a prize, feel free to donate to our cause, which of course, benefits Children’s Miracle Network Hospitals in the US. Prizes will be displayed in a slideshow during the stream, so check em out. Spoilers…one of the prizes is artwork created and donated by FE Heroes character artist Soeda Ippei! The above image has our full timeline schedule, so join when you can and say hello! 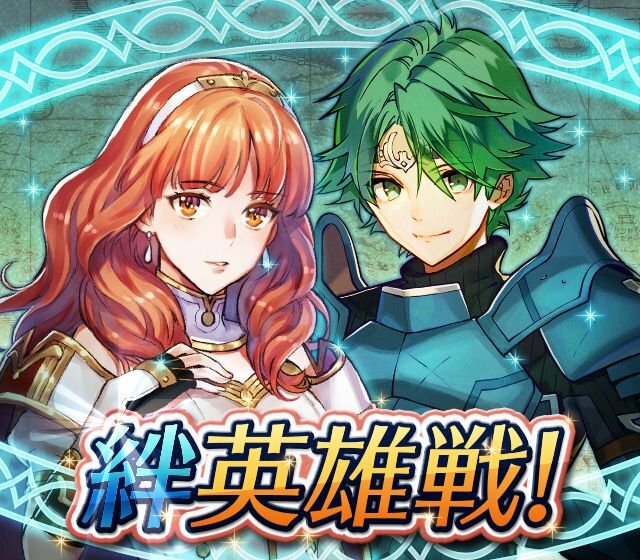 Fire Emblem Heroes is introducing a new type of Hero Battle: Bond Hero Battles, which focus on pairs of intimately-connected Heroes from across the Fire Emblem series. 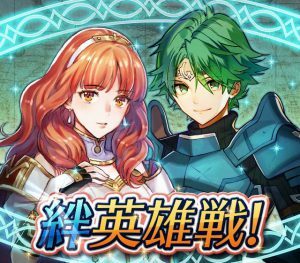 The first of these will feature Alm and Celica from the latest Fire Emblem Echoes: Shadows of Valentia–and it will be available starting from 6th July, a day before the next Tempest Trials starts. Unlike previous Hero and Grand Hero Battles, you do not gain any Heroes; instead, Orbs will be the prizes. At the time of writing, no further details, such as the amount of Orbs, have been revealed. Speaking of Orbs, the 10 Orbs and 10,000 Universal Crystals for smashing the 10 billion points total score for the War of Clerics Voting Gauntlet can now be redeemed. Make sure to grab them from the Present List before 18th July rolls over! GameXplain did a 2 hour stream of the now released Japanese version of Echoes, which you can see here. Derrick shows off the new prologue of the game, where Alm and friends are kids assisting Mycen fight off some invaders, before Celica goes on her own way to begin her training as a Priestess. Afterwards, the stream kicks into the video we saw from the original trailer announcement. Fast forward to the present; the new village mechanics are shown. Similar to Shin Megami Tensei IV, there are static images of characters to talk to, which can include townspeople offering hints or even your own allies sharing their backstories.